Bathroom projects can be as simple as just flooring, or as complex as a complete remodel. No matter, as there remains one source to ensure the project is a success - ProSource® of Canton. We stand ready to help you from start to finish with dedicated service, expert design services, a variety of top quality products, and wholesale prices. If you’re looking for a single location to find all your home remodel resources, our local showroom is your only destination. 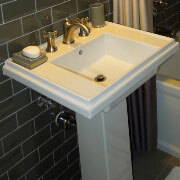 You’ll find the perfect bathroom sink when you visit our Canton showroom. We offer a large variety of sink styles, designs, and colors to match the aesthetic and functional goals for the entire bathroom project. 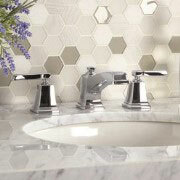 Find the perfect bathroom faucet to match the bathroom sink. From nickel to bronze, and from cross-handle to knobs, there’s a choice to meet any design and budget. When searching for the perfect faucet, stop by our showroom in Canton. If you’re working on a shower remodel, make sure to consider two factors: comfort and function. Our experts at our Canton showroom can help you find the best shower for your bathroom remodel including shower heads, handles, doors and bases. If you’re searching for a way to add extra storage space in the bathroom, consider a vanity. 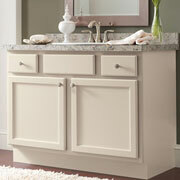 Vanities provide counter space and storage options to fit any need. With a selection of sizes and colors, your bathroom remodel can have the look and function you want. 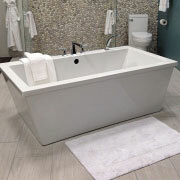 If you prefer a bubble bath with a set of jets to massage out the day, you’ll want to go with a jacuzzi style bathtub. Otherwise, you can stick with a standard tub. There are plenty of color and material options no matter which direction you choose. There’s no rule that a toilet can’t be stylish. 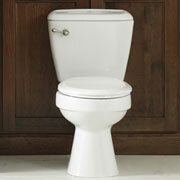 With an array of sizes and designs, there’s sure to be a toilet that completes your bathroom remodel.